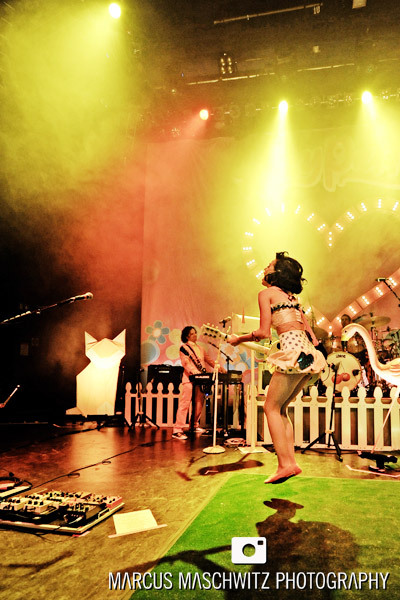 10 June 2009 – Tonight I shot with Katy Perry at Shepherds Bush Empire which was insane. Never before have I seen a pit that full with photographers. It really was a crazy experience. I think because Katy is quite hi-key and super popular in the fashion world it seemed like every magazine, agency, press person was there but it made for a good experience. I thought I would be able to experiment a bit with walking around but I must’ve been dreaming. I was so squashed up against the stage that I was basically underneath Katy and I had photographers leaning over me and lenses sticking out between my armpits. Honestly I wish someone was filming me so that I could show you. I was laughing so much. For these reasons though, I decided to stick to my Nikon 14-24mm F2.8 for this shoot so that I could shoot close stuff and not have to move too much. If I was any further away I would have 59 photographers in my way to shoot through and I really didn’t want that. Some of the shots came out really cool and Katy was super good. I would definitely be down to shoot with her again. She was really cheeky and just a good entertainer and that is what it is all about. UPDATE – A few of my photographs were used in a review on Clink Music Magazine so be sure to check it out.